A historic Protestant church in the Back Bay has rented out its building for a conference on apartheid in the Middle East, reigniting longstanding tensions between local Jews and Christians over the Israeli-Palestinian conflict. Organizers are bracing for protests and demonstrations outside Old South Church and in Copley Square during the two-day conference, which begins Oct. 26. The conference, titled "The Apartheid Paradigm in Palestine-Israel," is rapidly becoming another source of tension between the leadership of the Jewish community and mainline Protestant denominations. Its keynote speaker is scheduled to be Anglican Archbishop Desmond Tutu, who won the 1984 Nobel Peace Prize for his advocacy of nonviolence in the struggle against apartheid in his native South Africa. 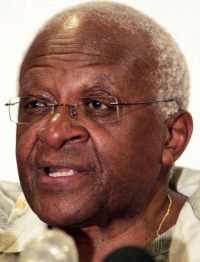 Tutu, in a 2002 appearance at Old South Church, compared the treatment of Palestinians by Israel to that of black South Africans during the apartheid years. The major Jewish community organizations in Boston say the use of the word apartheid in reference to Israel is inappropriate. "We absolutely, unequivocally, do not see Israel as an apartheid state," said Nancy K. Kaufman, executive director of the Jewish Community Relations Council of Greater Boston. Kaufman said the fact that Arabs living in Israel can serve in the Knesset, the Israeli legislature, demonstrates that the situation in the Middle East is not race-based discrimination. She also contrasted the resistance tactics of the African National Congress, which she said sought to minimize civilian casualties, with the terrorism associated with Hamas. "Anyone who uses apartheid as an accusation is really employing old anti-Zionist arguments - that's really what it is - and is really applying a double standard of judgment to Israel which can be traced to historic anti-Semitic rhetoric, that all things Jews do are evil, including their nationalism," Kaufman said. The apartheid conference is being sponsored by Friends of Sabeel, an organization of American Christians founded to support Sabeel, a Jerusalem-based organization of Palestinian Christians. Supporters say Sabeel is working for peace in the Middle East, but critics say it is working against the state of Israel. The Committee for Accuracy in Middle East Reporting in America, a Boston-based organization that argues media coverage of the conflict is biased against Israel, describes Sabeel as "an anti-Zionist organization that traffics in anti-Judaic themes." The senior minister of Old South Church, the Rev. Nancy S. Taylor, said her congregation is committed to the idea that conversation, even about contentious subjects, can help solve problems and broker peace. She noted that Sabeel is a partner of Old South's denomination, the United Church of Christ, and also that Old South has a long history of hosting debates on the American Revolution, the Civil War, women's suffrage, civil rights, and Vietnam. "We welcome the controversy because we are listening and learning," she said. "We view the Israeli-Palestinian conflict as a critical and central issue of our time and we are committed to the way of nonviolent debate and diplomacy . . . rather than to the ways of bullets, terrorism, name-calling, or stereotypes." Taylor said the congregation, aiming to acknowledge the variety of viewpoints on the Middle East, has also put together a series of talks at the church about interreligious relationships, featuring, the day after Tutu's speech, a talk by Dennis Ross, who was the Middle East negotiator for the previous Bush administration and the Clinton administration. Sister Elaine Kelley, a Brighton native and Catholic nun who is administrative officer of Friends of Sabeel-North America, said the purpose of the conference was "to educate area Christians, and to engage them in the issues, so they can challenge church leaders who in turn can challenge political leaders." "The theme of the conference is comparing South African apartheid with the situation in the Palestinian areas," said Kelley, whose group is based in Portland, Ore. "If you just look at the facts on the ground, you can see the situation of walls and checkpoints, which is so similar to South Africa." Among the other scheduled speakers are Episcopal Bishop M. Thomas Shaw of Massachusetts, and Boston City Councilor Chuck Turner. Organizers say the conference will be attended by a number of Jewish participants, and an organization called the Jewish Voice for Peace is planning a rally to support the conference. "Some people have demonized Sabeel and other groups and tried to present them as anti-Israel and anti-Semitic, and the fact is that isn't the case," said Martin Federman, cochairman of the Boston chapter of Jewish Voice for Peace. Tensions between mainline Protestants and Jews, largely at the level of organizational leaders, have been evolving for decades as the Protestant denominations have become outspoken in their unhappiness with the Israeli government. In Boston, the tensions flared in 2001, when Episcopal bishops joined a demonstration at the Israeli consulate, and then again more recently as multiple Protestant denominations considered divesting from companies alleged to be facilitating the Israeli occupation of the West Bank and Gaza. Earlier this year, controversy erupted at Brandeis University over an appearance by former President Jimmy Carter, who had written a book titled "Palestine Peace Not Apartheid." Tutu, a hero of the antiapartheid movement, has become a polemical figure for his criticism of Israel. Earlier this year, the University of St. Thomas, a Catholic university in Minnesota, decided not to invite Tutu to campus because of his remarks about Israel. But last week the university president reversed the decision.